The Russian M240 240-millimeter mortar, along with its vehicle-mounted counterpart the 2S4 Tyulpan or “Tulip,” is possibly the largest-caliber tube artillery, not including rockets, used in combat today. Its massive shells were intended to smash apart heavy military fortifications, but just as often they have been employed to rain devastation upon densely-populated urban areas. Armies’ fascination with big guns is often of doubtful relevance. The most extreme designs tend to remain impractical prototypes that rarely see widespread production or use. This is not the case with the M240 and 2S4, however. The Soviet Union first produced the giant mortar in the 1950s. Since then it has seen combat in Soviet, Russian, Egyptian and Syrian hands in six conflicts — the 1973 Yom Kippur War, the Lebanese Civil War in the 1980s, the Soviet war in Afghanistan in the same decade, the 1999 Second Chechen War and the current wars in Ukraine and Syria. Mortars are the infantryman’s personal artillery. Unlike heavy howitzers and field guns, lighter mortars can be disassembled and carried on foot and used at the discretion of low-ranking officers without them having to pass on a request to a separate artillery unit. Mortars deliver explosive payloads comparable to cannons of the same caliber and at a higher potential rate of fire, although at the cost of shorter range. A modern medium or heavy mortar typically has a range of three or four miles with regular projectiles, while a contemporary heavy howitzer might shoot to distances of 15 miles or more. But the sheer portability of the mortar — combined with its usefulness for concealed, indirect fire — has made it ubiquitous in guerilla conflicts and insurgencies around the world. Indeed, mortars are numbered among the “small arms” or “light weapons” that cause 90 percent of civilian deaths in contemporary wars. The M240, however, is an aberration. Mortar designs above 120-millimeter caliber are few in number — and the M240’s shells are twice that in diameter. Hardly a “light weapon,” the M240 weighs more than 9,000 pounds once its crew deploys it for combat, a process that can take 25 minutes. Each of its five-foot-long shells weighs 282 pounds and includes 75 pounds of high explosives. The huge mortar can lob these shells a distance between half a miles and five miles at a rate of fire of one shell per minute, although special rocket-assisted ammunition can extend that range to 15 miles. Instead of the coughing report that characterizes most mortars, each shot from an M240 makes a ringing sound like a gigantic bell as the projectile lances at a seemingly vertical angle into the sky. What is the rationale behind such a combination of extreme firepower and comparatively short range? Well, the M240 still weighs a lot less than other weapons of the same caliber do, such as the 32-ton 240-millimeter M1 howitzer still operated by Taiwan, and its shorter range is less of an impediment if used against an immobile, fortified target. In other words, the M240 is a siege weapon. The Soviet Union supplied M240 mortars to the Egyptian and Syrian armies, who gave the weapon its baptism of fire in the Yom Kippur War in 1973. The Egyptian mortars pounded the heavy Israeli fortifications along the Suez Canal. The Syrian mortars, grouped in a special high-level artillery formation, smashed the Israeli outposts on Mount Hermon and Tel Fares on the Golan Heights, disrupting Israeli communication networks and blinding artillery observation and intelligence-gathering posts. Alon Harksberg, an Israeli veteran of the battle on the Golan Heights, later wrote about the effects of a 240-millimeter bombardment. “With the 240-millimeter, warning [of an incoming bombardment] and cover didn’t really matter since if you happened to be in the same general area where they impacted, you’d be dead (if lucky) or horribly maimed/injured from giant shrapnel and flying debris (if not so),” Harksberg wrote. “During the war of attrition that developed on the Hermon following the 1973 armistice, the Syrians used 240-millimeter (and 180-millimeter [Soviet S-23 field guns]) to rake the ridge from end to end, sometimes on a nightly basis, until we put an end to that in an operation which still cannot be discussed. 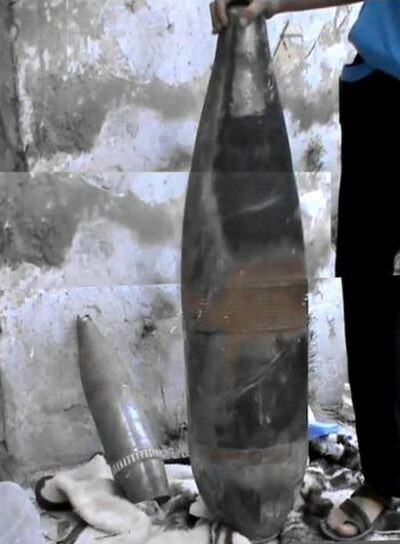 The Syrian mortars were not permanently silenced, however. Sixteen years later, in an ominous foretaste of their employment in the current Syrian conflict, 240-millimeter mortars and heavy 180-millimeter guns shelled East Beirut during the Lebanese Civil War. Meanwhile, the Soviet Union first employed its 240-millimeter mortars in combat in Afghanistan. Konstantin Scherbakov, a gunner in the 1074th Artillery Battalion, gave a detailed account of a 1985 strike against a fortress in the Panjshir Valley belonging to the Afghan warlord Ahmad Shah Massoud — yes, that Massoud, the future leader of the Northern Alliance opposing the Taliban, who was assassinated two days before the 9/11 attacks. The 1074th was equipped with M240 mortars towed by MT-LB armored tractors — not 2S4 vehicles as reported in some sources — and had received specialized laser-guided Smel’Chak, or “Daredevil,” rounds that could be directed by a laser designator. “Going into the gorge, the battery took up firing position on crests to the left and right of our units,” Scherbakov wrote. “Soon the situation was they had blocked our progress with DShK heavy machine guns firing from a protected position inside Massoud’s fortress. In a twelve-minute fire mission, the fortress was reduced to rubble. The engagement highlighted one of the advantages of the mortar system. Like all mortars, the M240 shot shells at a high-angle trajectory and could arc rounds over the walls of the fortress, while conventional bombardment from 122-millimeter guns simply slammed into the fortress walls. The laser-guided shells drastically improved accuracy and, furthermore, the sheer weight of the shells meant that they were little affected by meteorological conditions. However, the weapons could become dangerous if not well-maintained, Scherbakov recalled. “When firing, it was of great importance to thoroughly clean the barrel, literally after every shot […] Once we accidentally left a fragment from a previous shot in the barrel and the next shell jammed while loading. The towed M240s were replaced in Afghanistan by self-propelled 2S4 Tulip vehicles, where they continued to prove effective in destroying mountain strongholds and fortified caves. The 2S4 mounts the M240 mortar on a 30-ton armored vehicles with a crew of nine. The peculiar name comes out of a Russian tradition of naming self-propelled artillery after flowers. These vehicles equipped special “High-Powered Artillery Brigades” during the Cold War that had access to nuclear projectiles. The 2S4 showed up again in Russian service in the 1999 Second Chechen War, in a manner that foreshadowed tactics later employed in Syria. An independent 2S4 artillery unit “destroyed over 127 targets” in the separatist capital of Grozny, according to one source. One analysis stated that “[t]he Russians used these [2S4s] in the Second Chechen Campaign to help level Grozny […] Tanks and artillery ringed the city while dismounted infantry and special forces personnel, accompanied by artillery forward observers and snipers, slowly crept into the city searching for Chechen strong points. This article originally appeared at Offiziere. Podcast — Who Destroyed Ukraine?